"Impossible things are happening every day." There are a number of definite warm fuzzies from my childhood, and this production of Rodgers & Hammerstein's made-for-TV musical is definitely one of them. An instant hit when aired on CBS in 1965, it was repeated annually for about ten years, every year garnering new legions of fans. It finally had to be retired when it began to show its age, an unfortunate circumstance that sadly comes across in this DVD. The story tracks the famous Perrault fairy tale. Cinderella (Lesley Ann Warren) is treated as a ragged slave by her wicked stepmother (Jo Van Fleet), who favors her own clumsy and ugly daughters (1960s sitcom regular Pat Carroll and Barbara Ruick). 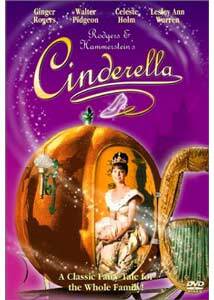 When the Prince (Stuart Damon) throws a ball to find himself a wife, Cinderella, left behind, is met by her fairy godmother (Celeste Holm). Soon it appears that dreams can come true as Cinderella is magically transformed into a princess who can attend the ball. But all will fall apart at the stroke of midnight, and Cinderella flees leaving behind only a glass slipper. This was the 18-year-old Warren's big break, coming off her first Broadway role, and she does surprisingly well with it. Being graceful and quite gorgeous (with the world's longest neck) doesn't hurt, of course, but she also lends some depth to her fairy tale character. She is appropriately wistful when imagining herself in a variety of roles, and as she flees the ball at the stroke of midnight, she simultaneously conveys dismay, despair and shame at her true situation. Stuart Damon (a regular on General Hospital and Port Charles) gives more to his prince role than one usually finds in such parts; when one thinks of the utterly colorless princes that populate Disney's movies, he comes as quite a revelation. Clever and a shade sardonic, and not just charming, he is quite believably a love object (besides being hunky). The supporting cast is also quite good, notably Ginger Rogers in one of her last film roles as the Queen, Walter Pidgeon as the King, and Celeste Holm. Jo Van Fleet is occasionally over-the-top as the wicked stepmother, but that's pretty appropriate under the circumstances. The music is, of course, first-rate. Rodgers & Hammerstein wrote this at the height of their success, and while portions of it evoke The King and I (notably In My Own Little Corner), it has charm and plenty of repeat value. But Rodgers also knows when to be quiet: the entrance of Cinderella to the ball, in complete silence, is tremendously effective. The lyrics are somewhat unusual in the depth they lend to a fairy tale; how often is there enough self-awareness in a Prince Charming in such works to ask himself Do I Love You Because You're Beautiful?" The production itself doesn't hold up terribly well, I'm afraid. Whether due to budget constraints or a desire to be stylish, the presentation is very much that of a filmed play. Settings are obvious painted flats, with no effort being made to disguise them. Special effects will look laughable to modern children, I'm afraid, which is too bad because this musical has a great deal of heart. I would hope that it reaches a new generation of children in the way that it reached us a couple generations ago. Image Transfer Review: This program was apparently shot on videotape, which is highly regrettable. The video master used here is predictably soft and smeary and suffers from some dropouts. The picture is quite lacking in definition altogether. The color is a shade washed out, but still pretty good, considering the source material. If it was shot on video, then I suspect this is as good as it's ever likely to look. Audio Transfer Review: The audio is presented in Dolby Surround, reworked from the original mono. There is plenty of sound in the surrounds, but no directionality to speak of. Distortion is frequent, with voices often sounding shrill. Music has heavy distortion and a tinny sound, particularly in Do I Love You Because You're Beautiful and Impossible. There is occasional warbling as if the tape were crumpled at some point. The end title music has regular crackling that sounds as if it were taken from an LP. Surely more could have been done to clean up this audio track? How very disappointing. 3 Other Trailer(s) featuring Bye, Bye Birdie, Annie, Oliver! Singalong to "In My Own Little Corner"
Extras Review: The highlight of the extras is A Cinderella Story, a 9m:50s featurette including current interviews with Warren, Damon and Holm. It's far too brief, and doesn't touch on the production history of the musical or the program very much. Warren and Damon do have some amusing anecdotes about their casting and dealing with Richard Rodgers, as well as the grueling shooting schedules. I definitely was left wanting more, much more. Very brief selected filmographies for Warren, Damon, Holm, Rogers, Pidgeon and Rodgers & Hammerstein are included, as is a singalong version of In My Own Little Corner. Wrapping up the package are three trailers from musicals, all of which are widescreen, but only one (Annie) is anamorphic. The disc is well-chaptered, with each number getting its own stop. The beloved musical in its classic 1965 version hits DVD, but alas the years have not been kind. While the substance is still excellent, the audio and video don't live up to modern standards, nor do the production values and effects. But there's still plenty to be fond of here, despite these drawbacks.